The term "supermoon" has come to be loosely in a full moon near perigee, or the point when it is near to earth in its elliptical orbit. 4 percent larger than one at apogee and 30 percent brighter. This term was actually first coined in 1979 by an astrologer named Richard Nolle, not by an astronomer. 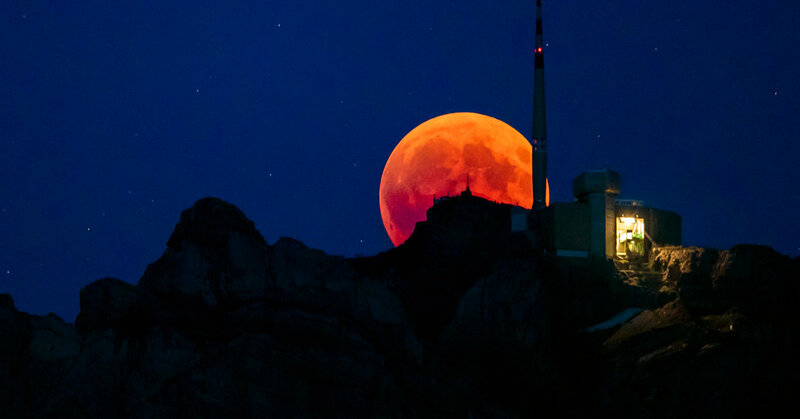 This is an embellishment of the coppery-red tint that the moon takes on any lunar eclipse. Sometimes it's more brown. The "wolf" title has been attributed to the Native Americans' name for January's full moon. According to The Old Farmer's Almanac, the term comes from the "Algonquin tribes who lived in regions from New England to Lake Superior." "The 'wolf' part, it's almost like this stereotypical, romanticized Annette Lee, an expert in indigenous astronomy at St Cloud State University in Minnesota. The term, "said, is an oversimplification that sets forth distinct Native American tribes together into one blob. For example, the Ojibwe tribe – which historically lived around Lake Superior and is a part of the Algonquin-language family – called both the month of January and its full moon the "Great Spirit Moon," she said. In their language, it is "Gichi-manidoo-giizis," according to Ojibwe.net.